Most digital and technology leaders are still at the early stages of this movement, but the future of work involves working side by side with AI and/or “digital colleagues”, according to Forrester. The report notes that employees need the help. The Gallup report State of the American Workplace found two-thirds of employees are not engaged in their work, while seven out of 10 don’t feel they have the materials and equipment they need to succeed, notes Forrester. Intelligent machines can help employees by taking routine and annoying tasks off their plates, delivering insights at key moments, and freeing up time for them to focus on more interesting and valuable work, according to the report by Forrester analysts J. P. Gownder, Pascal Matzke, Craig Le Clair, Ian Jacobs, Jennifer Wise, Michael Glenn, and Shayna Neuburg. Investing in technologies like intelligent assistants, virtual agents, robotic process automation (RPA) bots, AI-infused software, and even physical robots promise to augment humans’ capabilities, increasing their productivity and making them more effective at serving customers, they write. The benefits go beyond automating rote tasks. One of these is bringing insights to the edge. Organisations have a lot of data and algorithms most of which are stuck inside legacy systems and disconnected applications and are not available to employees when they need them. Sapho, a company interviewed by Forrester, aims to solve this problem by bringing data and actions of these systems directly to employee through a specialised portal or through notification-based micro-apps integrated into other systems. The human machine interaction can also tame complexity, the report states. Often employees need multiple apps to solve a single problem, and this can create friction and complexity. One AI startup, Talla, continuously adds a learning digital assistant to work with employees, and help new staff get up to speed. “We use a small-nudge interface to help lower the cognitive load facing employees and to solve problems,” Talla VP of marketing Juliette Kopecky tells Forrester. 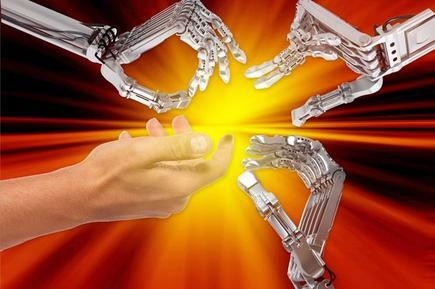 The report cites challenges ahead for organisations moving into human-machine collaborations. The analysts point out how smartphones, which use AI technology, often incorrectly autocorrect one’s typing. “We remain at the very early stages of how these technologies will transform work, and having reasonable, focused expectations is critical," they state. The report notes the imperative of focusing on the staff’s experiences in working with these technologies. “Bolt-on efforts don’t work; human-machine collaboration must occur at the employee’s moment of need, in context." 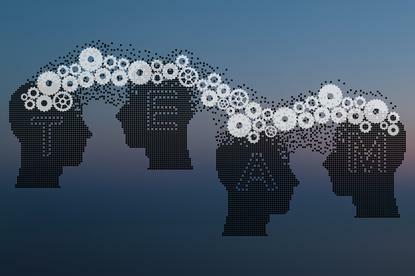 The Forrester report says designing cognitive moments involves a trigger (which establishes the need), context (which informs how the machine will fulfill the need), intention (or the goal of the employee) and insight or action, where the intelligent machine provides the data or acts to accomplish the goal of the employee. .
Often, these four steps must be compressed into a few seconds or less to be useful. Yet, Forrester notes a lot of organisations invest in non-cash incentives and rewards to drive behavioural changes rather than invest in employee journey mapping and tools to help get the job done.